Free Shipping on BSN Hyper Shred! HYPER SHRED essentially takes the idea behind the recent wave of ultra-concentrated pre-training powders and delivers it in pill form – serious energy promotion and training focus support, plain and simple. 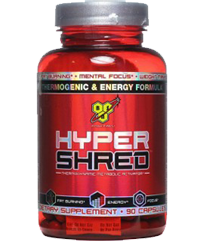 HYPER SHRED gives users an edge in their fat-burning efforts and is perfect as a pre-workout energy boost. 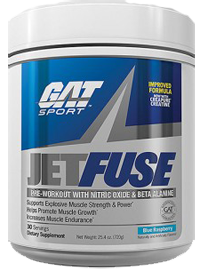 And because the concentrated formula only requires one capsule per serving, getting a daily dose of extreme performance support is as convenient as can be. For anyone looking to stay ahead of the curve and get clean, geranium-free energy, fat-burning and training support, HYPER SHRED is the state-of-the-art supplement choice. Thermodynamic Interfusion : caffeine anhydrous, bitter orange extract (citrus auratium)(30% synephrine) (Advantra Z), Red pepper (fruit)(2% capsaicinoids) (capsimax), black pepper (fruit)(95%piperine) (bioperine). Nootropic stimulators: bacopa (whole plant)(20% bacosides A&B) DL Phenylalanine, niacin, toothed club moss(aerial parts)(1% Huperzine A), pyridoxine HCL, riboflavin, thiamin mononitrate, cyanocobalamin. Insulino-Composite: banaba leaf (18% colosolic acid)(GlucoHelp), chromium chloride. Ingredients: Other ingredients: Hypromellose, Di-Calcium Phosphate, Magnesium Stearate, water, silicon dioxide, stearic acid, titanium dioxide, FD&C Red 40, Black iron oxide and FD&C Blue 1.